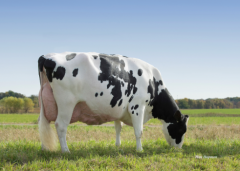 #1 Protein heifer in Europe: Col DG Corsa +92 lbs! During the intermediate run of May in 2018, there was a 5th place for Col DG Corsa with +2734 GTPI. This is high, but the thing that makes her so special is that she is the number 1 heifer in Europe to have +92 pounds of protein in her index! Her milk traits are overwhelming with a huge +2574 for milk! The pedigree makes her even better, she is out of the great Larcrest Crimson family. Which makes it the same family as DG Charley @ ABS. * #1 Protein heifer in Europe with +92 lbs! * #10 Protein heifer in the WORLD!